While in the wilderness, the children of Israel were commanded to construct a portable tabernacle. We learn in Exodus (25:8) that the reason for constructing the tabernacle was because the Lord wanted to dwell among His people: "And let them make me a sanctuary; that I may dwell among them." There are patterns in the tabernacle, in every detail of its construction, that testify of Christ. Many of the objects, details, and rites of the tabernacle seem very foreign and removed from our current modes of worship, yet they contain many great truths that are just as relevant today as they were four thousand years ago. Approximately 50 chapters in the Old and New Testaments contain details about the tabernacle. In the 1930s, a Christian theologian named C.W. Slemming published a series of short books on the tabernacle, the feasts and sacrifices, and the garments worn by the priests who administered in the tabernacle and how everything associated with the tabernacle and its functions symbolized Christ. These books are an almost forgotten treature-trove of enlightening information and in the next series of blog posts, I will make an effort to summarize these works, also applying a latter-day saint perspective. The first of these books is entitled "Made According to Pattern" and is focused on the specifications of the tabernacle and the materials used in its construction. A tabernacle is a temporary dwelling place. The Hebrew word for tabernacle, mishkan, primarily means a residence, and also a dwelling place, habitation, tent, or temple. 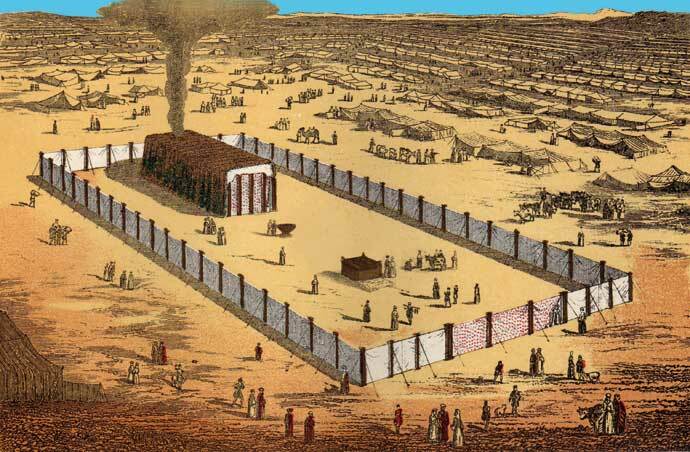 The children of Israel used the temporary tabernacle for over 400 years, until the Temple was built. Our mortal bodies are referred to as tabernacles, which is fitting as they are only temporary abodes or dwelling places for our continually existing spirits. The tabernacle was not a church. The term for church, ekklesia, means "that which is called out" and refers to a community of people called out for a special purpose, and not a building. "The church is a called-out company of people who meet together temporarily in a tabernacle until, by and by, they meet God and take up their abode with Him forever" (p. 15). The Book of Mormon contains several accounts of inspired individuals (eg, Lehi, Alma) who were called out of their present apostate surroundings, gather together in a community of like-minded believers (the church), and seek the Lord through use of temporary shelters, places of worship, altars, and congregations with the goal being becoming one with God. Christ made His temporary abode both within the dessert tabernacle (Old Testament) and in a body of flesh (New Testament). "The God who dwelt in the tabernacle and the temple in the old dispensation found an abode in Christ during his life on earth" (p. 15). Now, Christ holds a permanent, exalted position at the right hand of His Father. We too have the promise of immortality and exaltation through the merits of Christ. How was the Tabernacle Made? As the children of Israel were commanded to give of their best, their all, to help build this abode for the Lord to come dwell among them, we too should give our all, our best, to make our hearts, our tabernacles, a place where the spirit of the Lord can dwell. We will review the significance of all these materials used in the construction of the tabernacle, how they testify of or symbolize Christ, and what each means to us as disciples of Christ.